Mario Caya invented the BirTee golf tee after being inspired by his father-in-law and his son in 2006. After 2 years of R & D the first BirTee tees appeared in 2008. After a new design in 2011 the new BirTee Pro version gets full approval from the USGA on March 1st 2011, stating that all 8 tees conform with USGA rules of golf. 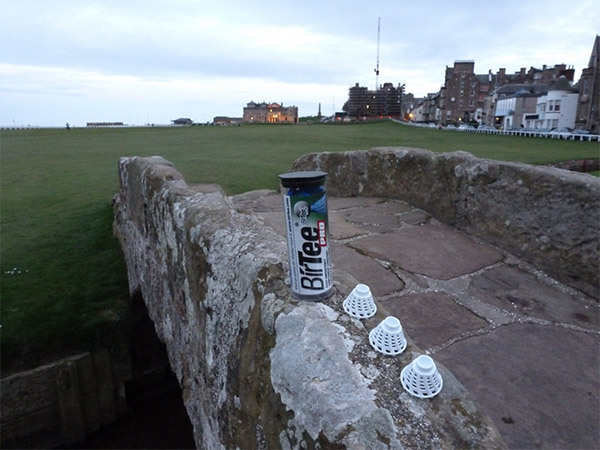 The BirTee Pro golf tee at St. Andrews! With over 20 years of experience as an elementary school teacher and coach, Mario was always looking for new ways to help his students and players learn new things. Maybe it’s the teacher in him that pushed him to find a solution to make teeing off Easy & Consistent after being inspired by 2 golfers struggling with teeing off on hard ground. The first inspiration was from a very experienced golfer, his 72-year-old father-in-law in need of a hip replacement and having problems with mobility. The second inspiration was from a very young beginner golfer, his 3-year-old son, who had no problems with mobility or flexibility, but struggled with pushing a tee at a constant height, especially if the ground was dry and hard, and it was very time consuming. So, Mario set out to find a solution to make teeing off Fast, Easy & Consistent for golfers of all ages, for clubs of all size and for all surfaces, even hard or frozen ground. BirTee Founder Mario Caya with his mother-in-law, father-in-law and children; 3 generations of BirTee users! The partial solution came about in 2006 when he hit an upside-down badminton birdie to practice his drives in his backyard. That’s where the Fast & Easy came from as well as the name “BirTee”. The consistency came many months later, after finding the right height difference for a set of 8 tees that would suit golfers of all ages and work for clubs of all sizes: Drivers, Woods, Hybrids and Irons. The 8 tees vary in height from ¼” to 2” by ¼” increments. Each and every golfer no matter what their age or size or ability, will find their favorite constant height for any club. Golf is a game of consistency and the BirTee Pro golf tees = Fast & Easy Consistency! 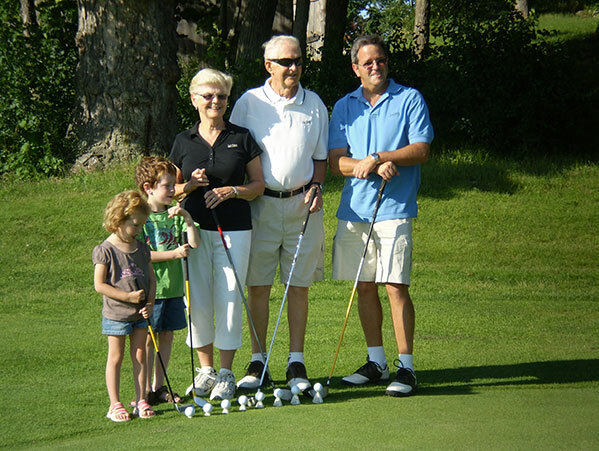 So, what started off as a family project to help his son and father-in-law has grown into an international business with BirTee Pro golf tees now used across Canada & the United States and also in Italy, Northern Ireland, Australia, Iceland and other countries around the world. BirTee Golf Ltd. will ship anywhere in the world.